Find hotel near Ambalapuzha Shree Krishna .. The Ambapuzha Shree Krishna Temple is supposed to have been built during the 15th – 17th century by the local ruler called Chembakasserry Pooradam Thirunal Devanarayanan Thampuran. The legend behind this payasam says that once Lord Vishnu appeared in the court of the king here and challenged him for a game of chess. The king being a chess enthusiast himself happily agreed to the invitation and told the sage to decide what prize he wanted if he won. The sage very modestly said that his needs were very few and he would only take grains of rice from him in a measure as how much it would be if they placed it on the chess board. They would have to measure it in such a way that the first square would have one grain, the second would have two, third would have four, the fourth sixteen and so on in a way that every square will have the multiple amounts of grains of its predecessor. The king not understanding the trick became upset that the sage asked for such a meager amount when he could happily give away so many other things. In an obvious manner the sage won the game and now it was time to measure the amount of grain in the decided manner. When the counting started the number of grains started increasing and it went on to more than a trillion and the king realized that he would not be able to fulfill his promise even if he would add all the grains of his kingdom and the neighboring kingdoms put together. In this moment of crisis, Lord Vishnu appeared in his avatar and told the king that he would not have to pay his prize at once but will have to in time. It id from that time that the payasam with milk and rice is offered to the Lord every day to pay off his debt. How popular is Ambalapuzha Shree Krishna Temple? People normally club together St. Marys Syro-Malabar Catholic Forane Church, Champakulam and Revi Karunakaran Museum while planning their visit to Ambalapuzha Shree Krishna Temple. 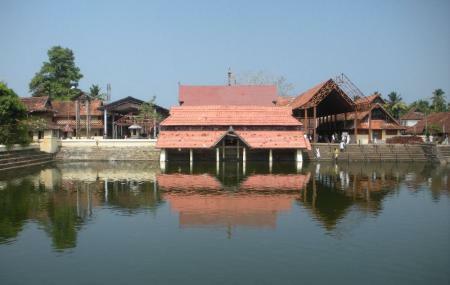 People also prefer to start their day with Ambalapuzha Shree Krishna Temple. It is the temple devoted Lord Krishna in young age form.Temple has a lot of history and people who love history nice to visit. Temple makes a special Payasam,(made in milk) it is very tasty. One should try once in a lifetime. Always overbooked. But there are some shops close by selling it. You have to pay more. For Indians, corruption is part of life people don't bother to pay more. ( I got that way) but it's worth. One the historical place to explore. The atmosphere is calm and quiet. The shrine is Lord Sri KRISHNA. 2 ponds at 2 sides. One is actually hidden but u can see it( it is located to inner portion of the temple). Very good place to meditate. A big temple with a nice view.. don’t miss the special Payasam which is offered at the temple at around 12pm.. there will a long queue standing for that and also serve for only 130 peoples per day..